An unforgettable voyage through some of the world's most scenic and unique lands in the Kane Creek Corridor. 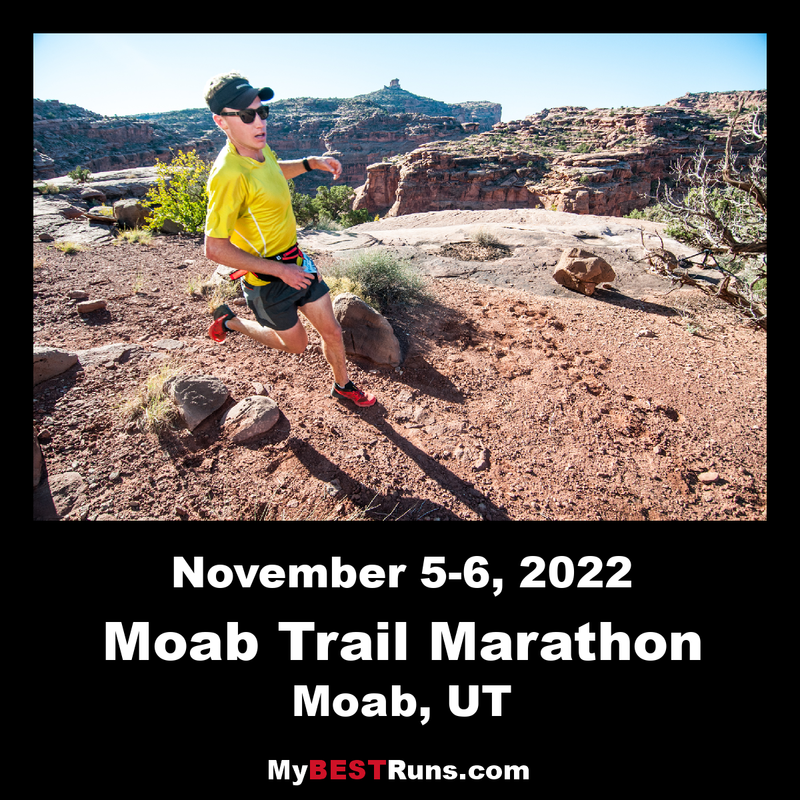 This event is sanctioned by USA Track & Field and will serve as the 2019 Trail Marathon National Championships. I hope everyone has been enjoying the winter season! This is a reminder that registration opened March 1st, 2018. Hope to see you all at the races, November 3rd and 4th, 2018! Trail Marathon National Championship! Stacked field of elites. Strong tailwinds the whole way. Crunchy quesadillas at the finish! Marathon: Starting at the Pritchett Canyon entrance, proceed up Pritchett Canyon Trail (5.7 miles of rugged jeep track) connecting to Hunter Canyon Rim Trail (1.8 miles), proceeding along the Hunter Canyon Rim single-track trail and down to Kane Creek Road (2.2 miles). Turn left and head south on Kane Creek Dirt Road to the Hunter Canyon singletrack trail (1.3 miles). Continue 1 mile up the canyon and turn around and come back out. Then continue south on Kane Creek Road (1 mile). Turn right and head up the “Scorched Earth Wall”. Once atop the rim, continue generally north on the faint jeep trail, which turns to singletrack, then slickrock, then off-track canyon bottom. Then you’ll turn left on the ‘Captain Ahab’ singletrack for 2.3 miles to Amasa Back jeep trail, continuing for about 3/4 mile. Then turn right onto the Jackson Trail singletrack, down to the Kane Creek drainage (1.8 miles). Continue to the aid station just after crossing Kane Creek and head through the tunnel, through the cave, through the arch, up the ladder and traverse the rope (.4 mile) then follow the technical shelf trail that parallels ‘Behind the Rocks Wilderness area’ (1.3 miles). Cross Kane Road under the culvert and continue along the flats through Kane Creek Campground (West) returning the final mile to the Kane Creek Parking lot finish area. 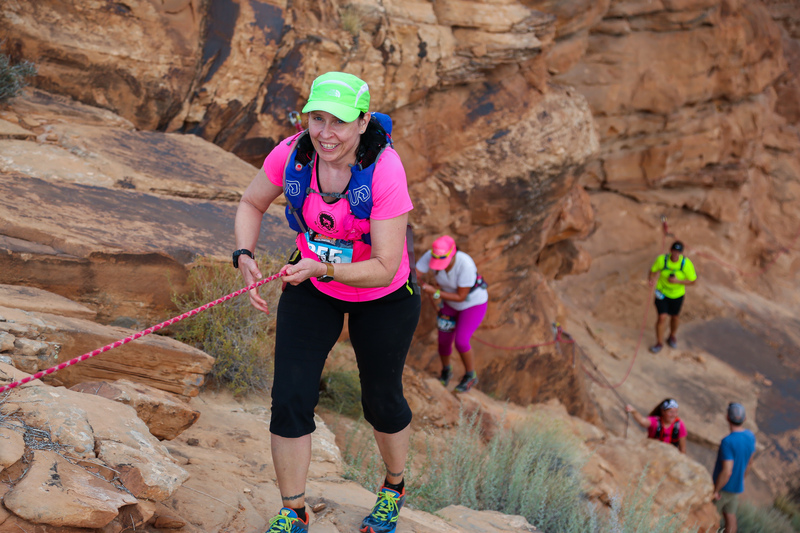 ½ Marathon: Start at the Pritchett Canyon entrance, proceed up Pritchett Canyon trail (5.7 miles) connecting to Hunter Canyon Rim trail (1.8 miles), proceeding along the Hunter Canyon Rim single-track and down to Kane Creek Road (2.2 miles). Turn right and continue up the infamous Kane Road switchbacks for about a mile, then back down to the Hymasa singletrack into the depths of Kane Creek drainage. Continue for 1 mile in the drainage, exiting at the Amasa Back parking lot for another ½ mile dirt road before the final ½ mile of singletrack with two crossings of Kane Creek before the finish.